I received this book in exchange for a honest review from BookLook. All opinions are 100% my own. This blog contains affiliate links. I didn't know what to expect when I picked up this book. Women Are Scary? That sounds like something my husband would say. Women Are Scary is about the adventure of having mommy friends. The book begins by telling us how to troll for some female friends, or in other words "date" other moms. After you find your mommy friends, it goes through the bases of a friendship. Think, going to first base, second, third, and hitting a home-run. It also goes into when you have to let a long-term friendship go, due to scary mommy! A popular blogger offers solid advice to forming mom relationships, leading readers from acquaintances to lifelong friends. Too many women are frazzled and lonely, isolated in their minivans while schlepping bags, strollers, and munchkins to and fro across town. It doesn’t have to be this way. Using humor and stories from the trenches of motherhood, Women are Scary leads readers from acquaintances to lifelong friends. I fell in love with Melanie Dale, yes, like in a full-frontal hug way. You will know what I'm talking about when you read the book. Yes, full-frontal hugs are a real thing. Melanie is hilarious! She is a pure hoot in a hand-basket. This book will totally make you want to be her friend because she is all about keeping mommy-hood "real". Us moms know all about the "real" mommy-hood! "Are you running errands this morning? Me too. Get in my van. I'll brush the crushed cereal off the seat. Your coffee is welcome, and feel free to spill it." "We need those friends who can see our homes in all their messy glory, who can see us wearing Jammie pants and no makeup." Melanie Dale will have you snorting and then throw a bible quote in. She is totally not prim and proper which makes this book adorable. Would I recommend Women Are Scary? Heck yes! Even if you don't need any new mommy friends, pick up this book. It's great for dealing with your current friendships, and has lots of different ways you can serve others. 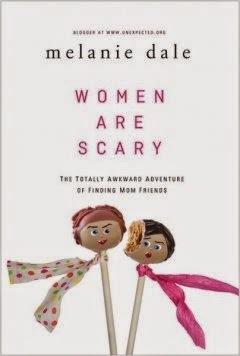 Click the link to purchase Women are Scary: The Totally Awkward Adventure of Finding Mom Friends . To learn more about Melanie Dale visit http://www.unexpected.org/.